Trump’s cardinal rule of diplomacy is simple: A deal that he didn’t make cannot possibly be any good. You don’t need a conspiracy theory to explain Russian President Vladimir Putin’s hold on President Donald Trump, just like you don’t need to understand the history of U.S.-Iranian diplomacy to understand Trump's latest Twitter tirade threatening Iranian President Hassan Rouhani. You just need to know one thing: Trump is a narcissist, a man with boundless self-regard. Former House Speaker Thomas P. (“Tip”) O’Neill Jr. coined a political axiom in “All politics is local.” Trump has his own version: All politics is personal. If Putin likes him and favored him in the 2016 election, nothing else matters. Narcissism could be the key to Trump’s entire foreign policy. Because Trump’s cardinal rule of diplomacy is simple: A deal that he didn’t make cannot possibly be any good. Former House Speaker Tip O’Neill Jr. coined a political axiom in “All politics is local.” Trump has his own version: All politics is personal. Trump insists he could negotiate far better deals than those made by former President Barack Obama (the Paris climate accord, the Iran nuclear deal, the Trans-Pacific Partnership) and by former President Bill Clinton (NAFTA). It includes deals made long before his time (the North Atlantic Treaty Organization) and deals made by foreign leaders (the European Union, Brexit). In May, Trump pulled the United States out of the Iran nuclear deal. He called it “decaying and rotten” and an “embarrassment.” Trump has since doubled down on his Iran aggression, tweeting that Iran “will suffer the consequences the likes of which few throughout history have ever suffered” if it threatens America. The message was directed at Iran's president, who warned Trump on Sunday not to trifle with his nation, claiming that: ""America should know that peace with Iran is the mother of all peace, and war with Iran is the mother of all wars." On matters of the environment and trade, Trump has been equally explosive. He rejected the Paris climate accord to combat global warming last year. He insisted it would “undermine our economy” and put America “at a permanent disadvantage. 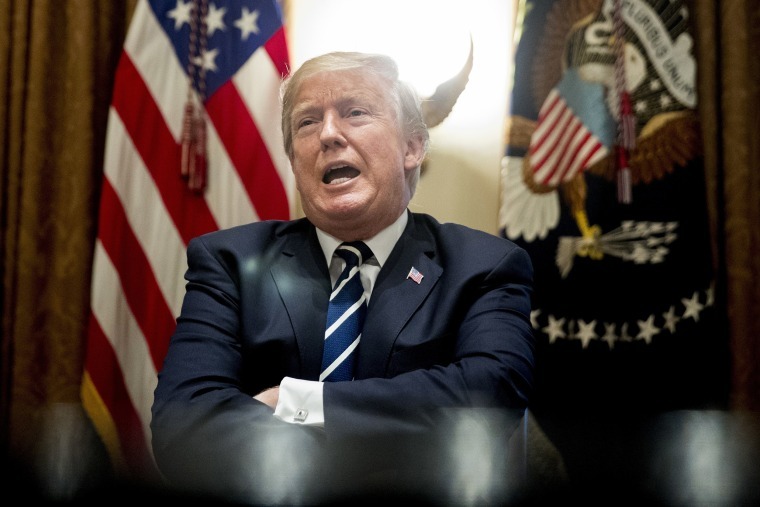 Trump has repeatedly threatened to terminate NAFTA, the 24-year-old North American Free Trade Agreement linking the United States, Canada and Mexico. He called it “the worst trade deal” ever signed by the United States. Trump also abhors the European Union — he recently labeled it a “foe” of the United States. He strongly supported Brexit, the 2016 British referendum to withdraw from the EU. He is now highly critical of British Prime Minister Theresa May’s plan for a “soft” exit, in which Great Britain would continue to abide by many EU rules. “I would have done it much differently,’’ he said when he visited Britain last week. “I actually told Theresa May how to do it but she didn’t agree. She didn’t listen to me.” He advised her to sue the EU. As for NATO, Trump called it “obsolete.” because it was not focused on counterterrorism. Trump says he is open to an alternative organization — a new NATO that he, as president, would have a strong hand in shaping. NATO is the most successful military alliance in history. Trump, however, seems to regard it as a protection racket: Allies are paying the United States to defend them. And they’re behind on their payments. Trump keeps saying he does not reject the idea of these agreements. He just wants them to be renegotiated. By him. “If we did a substantially better deal,” Trump told the World Economic Forum in January, “I would be open to the [Trans Pacific Partnership].” When he withdrew from the Paris climate accord, he said he would “re-enter on terms that are more favorable to our country.” Trump also promised to renegotiate NAFTA, although the process has stalled. Trump doesn't like losers. So naturally he hates the GOP leadership. Such tactics may still be perceived as working by his base and some allies in Congress, but this personal, zero-sum type of diplomacy is not working when it comes to international treaties, nor is there evidence that is helping ease the threats posed by North Korea, Iran or — yes, it is still a threat — Russia. Maybe Putin has compromising material on Trump or maybe the American president is merely allowing his ego to sabotage himself, as he has over and over again these past two years. So sad! Bill Schneider is author of the new book, “Standoff: How America Became Ungovernable." He is a professor at the Schar School of Policy and Government at George Mason University.